Home » Columns » Why do we care about celebrity feel-pinions? Why do we care about celebrity feel-pinions? IT’S funny, when celebrities say things we agree with, they’re important ambassadors or respected voices, shining a spotlight on an issue we think needs more attention. As soon as they venture off script, everyone clutches their pearls and starts a hashtag. The question is: What were we all expecting? I don’t know about you, but I never really thought of Sonia Kruger — a reality TV host previously best known for her ability to look good in a tropical fruit bikini — as an expert in immigration policy. I never once wondered about her opinions on Australia’s foreign affairs. And whatever those opinions happened to be, I certainly never thought of them as being of critical importance to national debate. And yet here we are, clutching our pearls and hashtagging all over the place because Sonia Kruger said something stupid on television. And yes, it was stupid. I’m sure Sonia Kruger is not stupid. Her long and varied showbiz career proves she is likely a very intelligent businesswoman. There is a lot to admire about her. But she was given a national TV platform to comment on an extremely complex sociopolitical topic, about which she has no more informed opinion than the average person on the street, at a time when tensions are running high. She is not a diplomat. She is not an academic. She is not a seasoned political journalist or foreign correspondent. 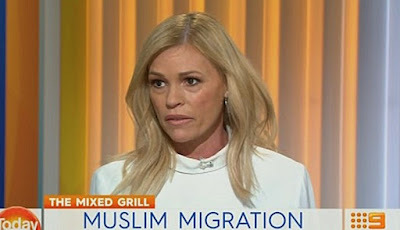 Why do we care what Sonia Kruger thinks about immigration? Really, why should we care what anyone who isn’t fully informed on the issue, or involved in it directly, has to say? I care what immigration minister Peter Dutton thinks about immigration. I care what Prime Minister Malcolm Turnbull thinks about immigration. I care what asylum seeker support centres and aid workers think about immigration. I care what immigrants think about immigration. For all I care about Sonia Kruger’s thoughts on Muslims, I might as well ask a post box for its opinion. I’m not saying Kruger isn’t entitled to her opinion. I’m saying the only reason that opinion made national headlines is because everyone was mildly surprised to discover Tina Sparkle had thoughts on foreign policy. A disproportionate amount of airtime and newsprint has been wasted over the last week dissecting Kruger’s words: whether she’s right, whether she’s wrong, whether she’s racist or whether she’s just “scared”, as The Project host Waleed Aly put it. Unsurprisingly, this is a discussion that has ultimately gotten us no further in finding a resolution to looming sociopolitical unrest. Perhaps giving uninformed, “scared” people a national media platform to spout their views on sensitive topics they know little about isn’t actually helpful. Perhaps we don’t need reality TV hosts directing debate on complex political issues. Kruger says her stance on banning Muslims was provoked by a photo of a child victim of the Nice terror attack, lying on the ground covered in a plastic sheet with a doll lying beside her. I know how she feels. I remember a similar photo, of three-year-old Syrian boy Aylan Kurdi, his lifeless body washed up on the beach in Turkey after his family’s failed attempt to escape the relentless bombing and gunfire in their home country. He died with his five-year-old brother, Galip, and mother, Rehan. They were trying to get to their relatives in Canada on a leaky boat, after the country rejected their formal asylum application. Immigration, war, refugees, Islam, terrorism — they’re all highly complex, intertwined issues with no clear resolution. We don’t need hashtags or celebrity “feel-pinions”. We need informed discussion. First published in The Advertiser, July 25, 2016. CLICK HERE to read the original article.